This past Friday, The Stasko Agency joined Zocalo Community Development to host a launch party announcing their newest project, Solera. We alluded to this new development in our last post, but we can now proudly reveal all the details. Solera will be a 120-unit, eleven-story high-rise rental development which is targeted for Gold LEED certification, placing it among only a handful of sustainable rental properties in the entire United States. Zocalo will be adapting their award-winning Solar Mortgage Program to apply to Solera’s tenants and hope to continue making new strides within the sustainable movement in Denver. The launch party, held on the site of Solera at 1956 Lawrence Street, was quite successful and we couldn’t be happier with the turnout! We even saw quite a bit of interest from the media. 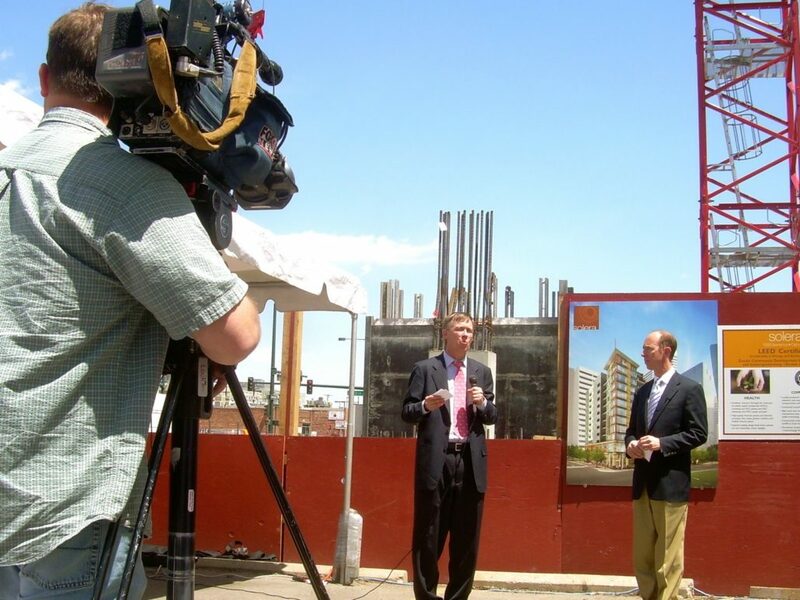 (Above: Fox 31 gets footage of David Zucker and Mayor Hickenlooper). Many thanks to the Mayor for spending the afternoon with us and showing his support for all that David and Zocalo Community Development have done through their earth-concious developments. Check out what the Westword had to say. Solera will also be launching a blog charting the different stages they will go through to reach Gold LEED certification. Make sure to stop by www.soleraliving.blogspot.com for semimonthly updates.